The UK Chancellor of the Exchequer, Philip Hammond, has revealed his second Budget of 2017. Amongst several of his announcements were cuts to economic growth forecasts, an increase in the minimum wage level from £7.50 to £7.83 in April, and the abolishment of Stamp Duty Land Tax for first-time buyers on house purchases up to £300,000. He stated that Brexit is “a top priority over the next two years” and indicated that £3bn more will be set aside in addition to £700m already allocated to Brexit preparations. He also states that more will be added “if and when needed”. One aspect pounced on by the media was the downgrade to the outlook for growth across the economy and the downbeat productivity figures compared to other G7 nations. 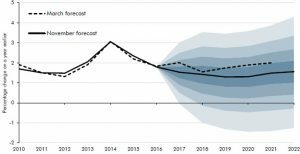 In reality, the Office for Budget Responsibility (OBR) have a very difficult task getting forecasts right. They have been wrong before, wildly so when they failed to forecast a further eruption in the Eurozone crisis back in 2012. Given the uncertainty associated with Brexit the OBR seem intent on being cautious. Cynics would say that the OBR may be playing the odds. If we see a breakthrough on UK and EU budgetary contribution discussions, and the mood changes from caution to optimism, then the requirement to upgrade their estimates will attract muted criticism. If growth falters they will be applauded. In the chart below, the OBR acknowledge the difficulty of getting forecasts right. They typically show a dispersion of what they see as the range of possible outcomes. This ‘fan’ range extends to above trend growth through to recession. The solid line is what they think is most likely and the dotted line represents their previous forecast. This highlights how they have guided their forecasts down. The successive lightening and darkening of shading shows 20% probability bands. 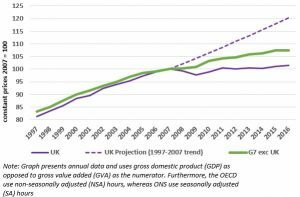 As mentioned earlier, the issue of the UK’s lacklustre productivity was also addressed by Phillip Hammond in his budget. Getting productivity up is a key challenge for the country because output per person has been failing to keep pace with the other G7 countries. In simple terms this means we are becoming less competitive and risk being unable to create wealth. In the chart below, the thicker line represents the collective productivity of the group of seven nations excluding the UK i.e. USA, Japan, Germany, Italy, France and Canada. 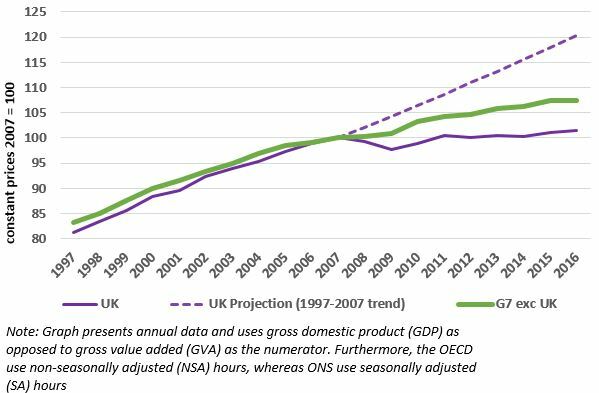 The second, and thinner, solid line represents the UK; which is clearly lagging behind in productivity terms since the credit crisis. 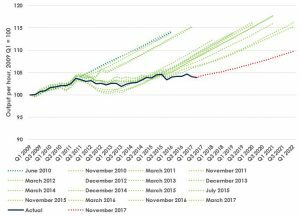 It is also undershooting earlier projections, as the dotted line showing the previous productivity forecast. In his budget Mr Hammond’s explanation for low productivity shows that he and his advisors are struggling with explanations. He said, “As the remarkable period of post-crisis weakness extends – and as various explanations pointing to a temporary slowdown become less compelling – it seems sensible to place more weight on recent trends as a guide to the next few years. But huge uncertainty remains around the diagnosis for recent weakness and the prognosis for the future”. 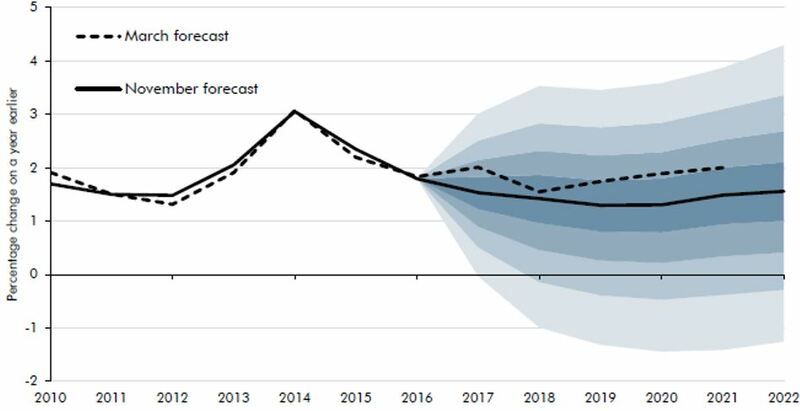 In the chart below we look at the way the OBR have been constantly revising their forecasts. 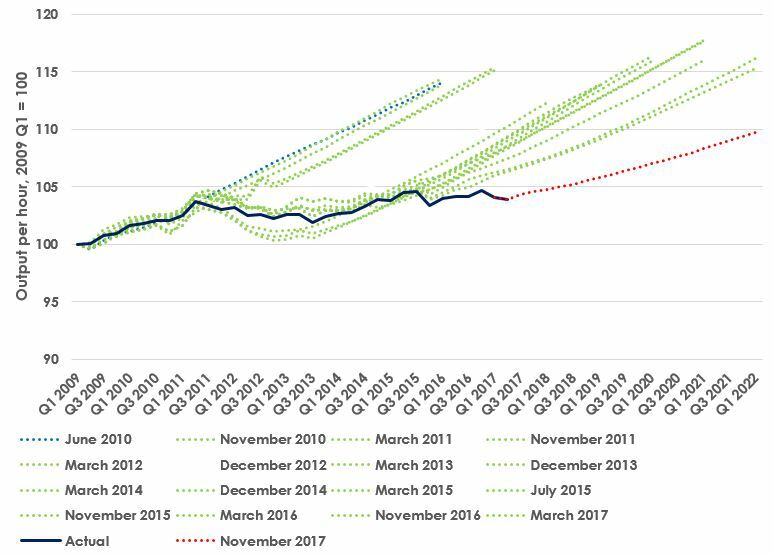 From this we can begin to appreciate that forecasting productivity levels is even more challenging than forecasting the trend rate of economic growth in an economy. In conclusion, there are various ways the government can influence productivity. This includes encouraging investment in machinery and technology or through research and development spending (R&D). The chancellor has also promised to add £9bn more into a productivity fund which now stands at £31bn as a step towards realising his “fairer Britain” vision. This fund will invest in a range of industries including housing, transport, R&D and digital communications. More detail can be found on the link below.